This artist's concept illustrates an asteroid belt around the bright star Vega. 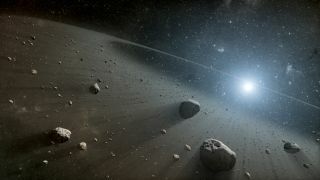 LONG BEACH, Calif. – Astronomers have discovered a giant asteroid belt circling the bright star Vega, a find that may ultimately reveal an entire solar system of planets, scientists say. Vega is one of the brightest stars in the night sky and located about 25 light-years from Earth. It gained fame as the fictional source of an alien signal in the science fiction novel “Contact” by famed astronomer Carl Sagan, which was adapted into a film starring Jodie Foster. The star’s newfound asteroid belt layout suggest that Vega is surrounded by an icy outer belt of asteroids, as well as a warm inner space rock belt, researchers said. Their presence is also a clue that Vega could be surrounded by multiple undiscovered planets, they added. Astronomers have discovered what appears to be a large asteroid belt around the bright star Vega, as illustrated here at left in brown. The layout of the twin belts make Vega look similar to our own solar system, which contains both the Kuiper belt and the asteroid belt. The findings are also similar to recently discovered belts found around another star called Fomalhaut. "Our findings echo recent results showing multiple-planet systems are common beyond our sun," said Kate Su, an astronomer at the Steward Observatory at the University of Arizona. Su unveiled the new findings here Tuesday (Jan. 8) at the annual meeting of the American Astronomical Society. "Overall, the large gap between the warm and the cold belts is a signpost that points to multiple planets likely orbiting around Vega and Fomalhaut,” Su said. For both Vega and Fomalhaut, the outer asteroid belt is 10 times farther away from the star than the inner belt, which suggests that several planets the size of Jupiter or smaller orbit may exist between the two bands, sweeping their orbits clean of dust and debris, researchers explained. The asteroid belts around both stars are filled with much more debris than that of the belt in Earth’s solar system, likely because the stars are younger than the sun and have had less time to clean up that dust. The two star systems also likely started out with more dust, researchers said. Su and her colleagues discovered the alien asteroid belts around Vega because the collisions between comets and space rocks create dust, which then emitted infrared light picked up by the Spitzer and Herschel observatories. If there are unseen planets orbiting Vega, astronomers are confident they won’t stay hidden forever. "Upcoming new facilities such as NASA's James Webb Space Telescope should be able to find the planets," paper co-author Karl Stapelfeldt, chief of the Exoplanets and Stellar Astrophysics Laboratory at NASA's Goddard Space Flight Center in Greenbelt, Md., said in a statement.